Mature and reliable technology for medium to high density devices. Fine Pitch Leaded Chip Carrier typically have top brazed or bottom brazed leads that are ideal for higher density surface mounting applications that require increased joint reliability. 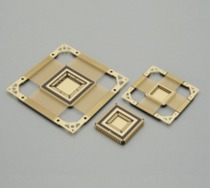 Both HTCC and LTCC materials are available. Please see Applications Notes for more details. Products can be ordered in all size lots as needed. We also offer optimal designs and standard products to a wide range of applications.